In anatomy, the term rostrum (from the Latin rostrum meaning beak) is used for a number of phylogenetically unrelated structures in different groups of animals. In crustaceans, the rostrum is the forward extension of the carapace in front of the eyes. It is generally a rigid structure, but can be connected by a hinged joint, as seen in Leptostraca. Among insects, the rostrum is the name for the piercing mouthparts of the order Hemiptera. The long snout of weevils may also be called a rostrum. Gastropod molluscs have a rostrum or proboscis. Cephalopod molluscs have hard beak-like mouthparts referred to as the rostrum. Crustacean: the rostrum of the shrimp Macrobrachium rosenbergii is serrated along both edges. 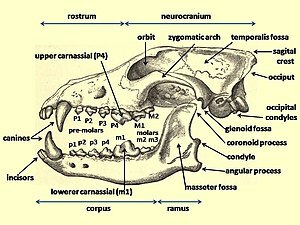 In mammals, the rostrum is that part of the cranium located in front of the zygomatic arches, where it holds the teeth, palate, and nasal cavity. The beak or snout of a vertebrate may also be referred to as the rostrum. Some cetaceans, including toothed whales such as dolphins and beaked whales, have rostrums (beaks) which evolved from their jawbones. The narwhal possesses a large rostrum (tusk) which evolved from a protruding canine tooth. Some fish have permanently protruding rostrums which evolved from their upper jawbones. Billfish (marlin, swordfish and sailfish) use rostrums (bills) to slash and stun prey. Paddlefish, goblin sharks and hammerhead sharks have rostrums packed with electroreceptors which signal the presence of prey by detecting weak electrical fields. 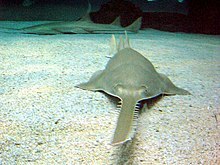 Sawsharks and the critically endangered sawfish have rostrums (saws) which are both electro-sensitive and used for slashing. The rostrums extend ventrally in front of the fish. In the case of hammerheads the rostrum (hammer) extends both ventrally and laterally (sideways). ^ Charles Drew (November 17, 2003). "Crustacea". University of Bristol. Retrieved November 7, 2010. ^ Todd A. Haney, Joel W. Martin & Eric W. Vetter (2007). "Leptostraca". In James T. Carlton (ed.). The Light and Smith Manual: Intertidal Invertebrates from Central California to Oregon (4th ed.). University of California Press. pp. 484–495. ISBN 978-0-520-23939-5. ^ George Gordh, Gordon Gordh & David Headrick (2003). "Rostrum". A Dictionary of Entomology. CAB International. p. 792. ISBN 978-0-85199-655-4. ^ Douglas Grant Smith (2001). "Mollusca (gastropods, pelecypods)". Pennak's freshwater invertebrates of the United States: Porifera to Crustacea (4th ed.). John Wiley and Sons. pp. 327–400. ISBN 978-0-471-35837-4. ^ Burt Carter. "Cephalopods". Invertebrate Paleobiology. ^ "Basic anatomy of Cetaceans - Dolphins". Robin's Island. Archived from the original on November 17, 2010. Retrieved November 7, 2010. This Arthropod anatomy-related article is a stub. You can help Wikipedia by expanding it.